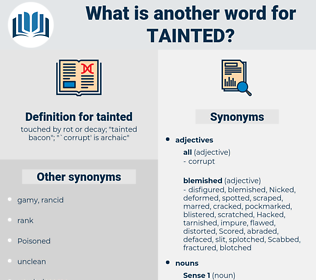 What is another word for tainted? touched by rot or decay; " tainted bacon"; "` corrupt' is archaic"
flawed, corrupted, impacted, rotten, affected. Accentuated, characterized, imprinted, characterised, afflicted, Influenced, impaired, humiliated, conditioned, Overshadowed, Contravened, violated, undermined, embarrassed, altered, distorted, Poisoned, disgraced, Punctuated, tagged, harmed, labeled, labelled, prejudiced, weathered, biased, Bedevilled, stamped, depraved, amended, mediated, tempered, coloured, involved, damaged, pronounced, Swayed, plagued, defiled, eroded, etched, changed, smudged, imbued, tarnished, modified, scarred, scheduled, Flagged, checked, shaped, Moulded, Compromised, varied, sullied, marred, clouded, humbled, geared, surrounded, marked, driven, flawed, corrupted, impacted, affected. pure, clean, fresh, nice, moral. uncut, refined, sterilized, concentrated, clarified, uncombined, strong, immaculate, pasteurized, ultrapure, uncontaminated. For instance, he considers chemistry as tainted with the metaphysical mode of thought by the notion of chemical affinity. Had not the India House recently been the very den of corruption, the tainted spot from which the plague had spread to the Court and the Council, to the House of Commons and the House of Lords?